American cockroaches are 1,5 inches long, making them the largest of the house-infesting cockroaches. 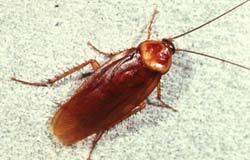 American cockroaches generally live in moist areas, but they can survive in dry areas if they have access to water. American cockroaches prefer warm temperatures. In residential areas, these cockroaches live in basements, around pipes and sewers, and may move outdoors into yards during warm weather. These cockroaches can be found in basements, crawl spaces and foundations.